If your present circumstances are such that there seems no way of improvement by "normal" means, then you should consider turning to MAGICK. "Magick" is exactly what it implies - the occurrence of desired effects by supernatural means. We are not referring to "magic", the entertainer's tricks of illusion and deception. We are talking here about the REAL THING. There is no rational explanation for the effects of MAGICK. Magick is Magick. And neither is there any point in turning to a book of this kind if you do not believe in the supernatural. There must be belief in order for Magick to work. If you are a "believer" then read on - if not then this book will be of no value to you. There are two points we must make absolutely clear. First: this is not a book promising "instant results". There are no gimmicks here. 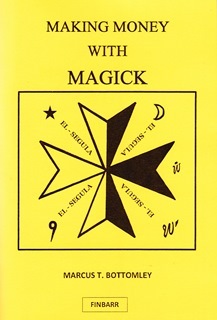 This book is a serious magickal work for making money through Magick. Its instructions require time and patience. But the effort is well rewarded. The reward is a solution to your financial problems, AND ALL THE MONEY YOU WILL EVER NEED. This is what Magick is all about. But remember - there are no short cuts. The rituals require time, practise and patience. The second point is that the reader should understand that Magick is not about calling up the Devil or demonic agencies. Religionists, fearful of the power of magick, would have you believe this. You are not required to compromise ethical values. You are only required to compromise your shaky financial circumstances. It does not matter if you have never tried magick before. This book explains everything from the beginning. Although gimmickless, it is not written in a difficult or heavy manner. A child can understand its instructions. It is a book of practice rather than theory. The author Marcus T. Bottomley (who, in our view, is worth a dozen of more other occult writers) explains what the others don't or won't tell you. He inspires confidence because one senses that he knows. He has practised Magick since childhood. What he doesn't know about the subject isn't worth writing about. When you practise Magick your situation in life becomes inconsequential. magick puts a humble street cleaner on the same level as a corporation executive. In Magick you contact the invisible, angelic forces that control life. You become in touch with the powers that CONTROL THE FLOW OF MONEY. You can be bankrupt and down to your last penny, but NOTHING CAN STOP MAGICK WORKING ONCE YOU START. IT IS THE ONLY WAY OUT OF FINANCIAL DISTRESS WHEN THERE IS NO OTHER "CONVENTIONAL" WAY OUT. This book will be of singular benefit to (1) persons seeking a long term solution to present financial difficulties, and (2) persons desirous of money and riches but have no chance of acquiring some because of their mediocre income. Magick does what nothing else can. Poverty cannot oppose its force.